The New York of the Jean-Michel Basquiat film Downtown 81 seems an incredibly romantic and glamorous place to be. That is perhaps an incredibly stupid thing to say about the Lower East Side and all its seedy glories, but I absolutely adore the idea of walking the streets without a cent or sense, to a soundtrack by the Lounge Lizards, with a bit of graffiti here, a dodgy deal there, a hip hop jam taking place in one room, an art punk outfit rehearsing next door, and a queen of the pop scene hanging out with the lowlife and chancers. Just imagine the Defunkt-era James White and the Blacks playing in one club, DNA kicking up a squall of a pop storm in another rehearsal room, Blondie hanging out with Fab Five Freddie, Tav Falco sitting chatting with a starving poet, Marley Marl rapping over a No Wave break. I do, often. The girls in Luscious Jackson grew up with this as their norm. Posters of Debbie Harry on their walls, sneaking in to the Mudd Club or Pier 3 or Danceteria after highschool, dancing to the Bad Brains and Afrika Bambaata, The Clash and Grandmaster Flash, Black Uhuru and Slits, hanging out with the punks and the b-boys. And while that downtown scene seemed so glamorous to me, the pioneering pop from the UK by the Slits, Raincoats, Au Pairs and Delta 5 will have seemed impossibly romantic to teenage girls reading about it all in imported copies of The Face, then the best pop magazine around. The girls in Luscious Jackson would get a reputation as members of a girl gang that ran around the Lower East Side, dressed like members of the Slits. They would produce fanzines, and indeed an interview with Viv of the Slits from Jill Cunniff’s The Decline of Art fanzine would later be reproduced in an early edition of Beastie Boys’ Grand Royal magazine. Kate Shellenbach would play drums for an early incarnation of Beastie Boys at just 15. Some of the groups that the girls from Luscious Jackson grew up on, like ESG, Bush Tetras, and Liquid Liquid, were the core of New York’s greatest underground label, 99 Records. It’s a terrible generalisation but these groups’ music would reflect the cultural cauldron that was the downtown scene. 99 would embrace rule-breaking sounds from all over the place, and would release records by the likes of Vivien Goldman, Maximum Joy, Singers and Players, and Congo Ashanti-I, that had links to the UK and the post-Pop Group milieu of labels like On-U and Y, and characters like Adrian Sherwood and Steve Beresford. These influences would inform the early sound of the early Luscious Jackson at the start of the ‘90s. Bringing together the best of many possible worlds, the Luscious Jackson sound could be said to be ESG meet TLC, En Vogue backed by the Bush Tetras, or Laura Nyro arranged by Liquid Liquid. It could also be said to be a continuation of another golden pop age where there was De La Soul, Neneh Cherry’s Raw Like Sushi, Sonic Youth, A Tribe Called Quest, Soul II Soul, Public Enemy, Deee-Lite, and the start of Massive Attack. The funny thing is that when the Luscious Jackson sound came together it was a pretty perverse stance. It would be some years before interest in the downtown ’81 New York scene would be reignited. It was to be some years before Mo’Wax put together its Liquid Liquid compilation and Soul Jazz collated its ESG set. Oddly only Henry Rollins would start to salvage the sounds from back in those days, with some important James Chance and the Contortions and Bush Tetras compilations. Indeed ironically by the time those Downtown ’81 sounds were all over the place again, the Luscious Jackson sound was more urbane than urban, and Jill Cunniff was off writing for Emmylou Harris and Linda Ronstadt. 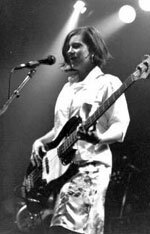 The girls in Luscious Jackson have acknowledged the importance of Mudd Club DJ Anita Sarko in their musical development. They would sneak in, hoping to hear Bad Brains, while the soundtrack would throw together rap, jazz, funk, soul, punk, reggae, african and latin sounds. Such miscegenation would seep through too into the sounds of some of the more successful acts of the time. Blondie would embrace hip hop on 'Rapture', The Clash’s Sandinista covered all music bases (and even the Mick Jones in Big Audio Dynamite would get a young Sam Sever on board early on to add some beats), and Talking Heads’ side projects like the Tom Tom Club twisted disco and club sounds into new shapes in a wonderfully fun way with the help of Steve Stanley’s midas touch out at Compass Point, following in the fantastic footsteps of Lizzy Mercier Descloux and Grace Jones. The two core Luscious Jackson sets, Natural Ingredients and Fever In, Fever Out are gorgeously melodic and organically funky, and thus decidedly odd in that they had an almost acoustic flow when everybody else seemed to be determinedly rocking out. The closest comparison could be the hits from Siouxsie and the Banshees’ Kaleidoscope set, and indeed 'Christine' is almost explicitly referenced on a song of the same name from the LJs’ final Electric Honey record, where Jill sings: “Christine was the Queen of the Teens, she sang into the shadows to be free, always lookin’ for something beautiful to sing to. When school nights kept her in, she listened to the records in the basement, always lookin’ for something beautiful to sing to”. It’s the song that makes that record worth having. 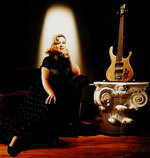 Luscious Jackson wanted Electric Honey to be the record people played when they broke off from playing The Miseducation of Lauryn Hill. It’s the right aim to have. There’s a school of thought that says Electric Honey would have benefitted from the stark simplicity of the Kostars, an LJ-side project where Jill Cunniff and Viv Trimble put together a set of beautifully brittle acoustic songs, that are coolly ascetic, and where it’s easy to see the growing interest in Emmylou Harris’ back catologue and all that incredible beauty and grace. There was a deliberate exaggerated ordinariness about Luscious Jackson that was incredibly uncompromising, which reminds me of the Slits singing 'Improperly Dressed'. Dancing to Jill singing 'Naked Eye' seems so right like the Chicken Lips collective putting the Raincoats’ 'Animal Rhapsody' on its !K7 DJ-Kicks set alongside Sharon Redd’s 'Beat The Street'. And there’s a line in E L Doctorow’s Book of Daniel that says: “I could not forget the commitment in his absurdly naked eyes; or in his act, the quality of calmly experienced, planned revolutionary sacrifice“. That exaggerated ordinariness was entirely subversive and downright contrary. And we’re speaking about a contrariness that manifests itself in Jill Cunniff writing achingly lovely songs with Emmylou Harris, such as 'Sweet Spot', and then popping up a while later as the “groove godmother” behind the Cooler Kids, which are like real hands-in the-air disco madness with a cutting edge, in a Kylie/Deee-Lite vein, but then even 'Buffalo Stance' started life as Stock/Aitken/Waterman b-side.